US Lieutenant General James Terry, Commander of the International Security Assistance Force and Deputy Commander of US Forces, recently provided an update on the development of the Afghan National Security Forces (ANSF). He made two important points: the ANSF has taken responsibility for security for a large part of Afghanistan, and yet substantial work still remains to build a force that can sustain itself after ISAF withdraws in 2014. Afghan National Army deploys armored transport vehicles. ANSF combat forces have transitioned to the lead in combat operations in much of Afghanistan. ISAF forces had a “partnering” relationship in which ANSF and ISAF worked side by side in both planning and executing combat operations. Starting in June 2012, the ANSF and ISAF began transitioning to a new ‘Leading/Supporting’ relationship. ISAF began withdrawing full combat brigades and replacing them with smaller support brigades, while partnered ANSF units transitioned to leading operations with the US teams in support. Transfer of security responsibility to the Afghan National Security Forces..
Concurrently, the ANSF began taking over the security responsibility for areas of Afghanistan. This process was planned for five phases, or tranches. The first tranche started the transfer of security responsibility to the ANSF in July 2011. The latest phase, Tranche 4, will begin in March. With this phase, the ANSF will have taken ownership of areas that contain 87% of Afghanistan population. 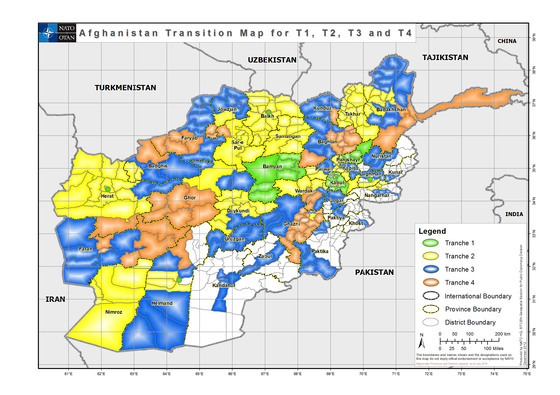 These areas will transfer to the ANSF sometime in 2014. Afghanistan is currently in the winter lull. Fighting will pick up in again in April as this summer’s fighting season resumes, providing a major test of ANSF’s ability to maintain security across Afghanistan. While the ANSF’s combat units are relatively mature, its combat support units are much less so. Development activity has shifted to building these units. Looming over this is the impending withdrawal of US and ISAF forces from Afghanistan, the vast majority of which will leave by the end of 2014. While the US/ISAF provides most of the ANSF’s combat support functions right now, there are no plans to continue this support after 2014. This leaves the ANSF with limited time (and money) to build of its own capability. Therefore, the ANSF has scaled back on its plans. Instead of building the combat support units to the standards of Western armies, the units will be built to lower, although still effective, Afghan standards. One example of the necessary scaling back is medical evacuation of battlefield wounded. For Western armies, the wounded are evacuated by helicopter directly from the battlefield to a fully equipped military hospital. For the ANSF, however, evacuation will be done using ground transportation, and the wounded will be evacuated to the nearest civilian medical facility. Another example is fire support. Currently, US/ISAF provides ubiquitous fire support with attack aircraft and helicopters. But fire support from the Afghan Air Force will not be available by 2014, if ever. Consequently, the ANSF will have to rely on fire support from ground units, which would mean 60mm mortars for infantry companies and 122mm howitzers for infantry battalions and brigades. 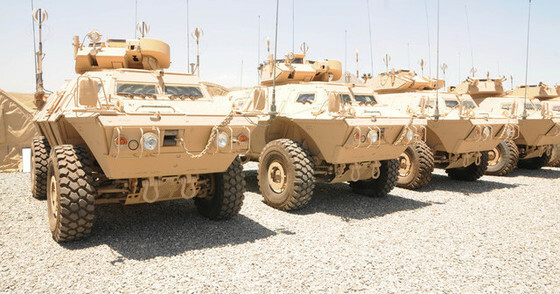 Other Afghan combat support units being built include armored transport vehicles, logistics, counter-IED, and transport helicopters. But the essential fact remains that the ANSF will be substantially on its own after 2014. It will have to live with whatever it can build by then.